“El curso ha sido completamente satisfactorio: la enseñanza fue exactamente como quería que fuera porque además del estudio de gramática, he mejorado mi español hablado y he aprendido sobre histori y cultura de España. El material didáctico ha sido muy útil. Lo recomendaría a quien quiera aprender español”. 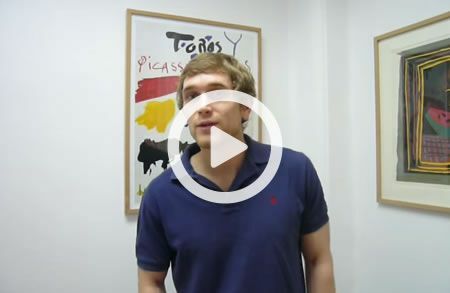 “Coming to La Casa del Español was a great chance to improve your Spanish! You are given the choice of what you would like to study, wich means the couse is taliored to your needs. The grammar sessions were very useful ans I thoroughly enjoyed the oral lessons. Besides the Spanish host family was absolutely lovely”. “La Casa del Español is a great place and a way to learn Spanish with a perfect balance, and what is more important, you get tutored help with what you want to do to enhance the learning of the language”. “I really enjoyed my stay, my family were incredible; welcolming, warm and we visited all sorts of lovely places and attractions, as well as trips to the beach and other parts of the countryside. Theymade me feel right at home and involved me in everything they did. As well as this they gave me a lot of freedom to explore Valladolid and encouraged me to spend time by myself to enjoy the city. They were understanding of the language barrier and made sure I felt comfortable, and at ease to let them know if I had any problems. “He tenido suerte de elegir La Casa del Español. He estudiado mucho con los profesores y me encanta. Me ayudan a encontrar los fallso y ahora tengo m uy claro cómo estudiar en el futuro. ¡Durante un mes, casi he olvidado mi idioma! “Estoy muy contenta de haber estudiado aquí en La Casa del Español. Los profesores tienen muy buena actitud y nos dieron seguimiento durante todo el curso, son muy profesionales y hay muy buen ambiente de estudio donde poner en práctica todo lo que sabes. Me da pena volver a Italia, quiseira quedarme aquí, porqeu Valladolid es una ciudad magnífica que cada día me encanta más. ¡Hasta pronto! “My time in Spain was really eventful and educational. La Casa del Español has achieved the best possible combination for the student looking to gain a high level of fluency in a short period of time. Most of my time was spent with the family whom I ate breakfast and dinner (the food was excellent throughout). They made a great effort to speak and explain things to me in Spanish which, although difficult for me at the beginning due to my relatively repertoire, really improved my Spanish in the short time that I was with them. Being accommodated with someone my own age was also great as I met his friends who were good fun. “¡La Casa del Español es la mejor! The teachers are patient, the schedules are flexible. The encourage you to be confident with what you learn in class and use it every day to grow as a Spanish speaker”. “Really good fun, good lessons, with useful learning”. “Al principio, cuando empecé las clases en septiembre, no podía decir nada en español y ahora la gente me entiende y puedo vivir en España con normalidad”. “The organization of the arrival, providing detailed information with maps and schedules was very useful. I didn’t feel lost and alone in a new city. My stay in Valladolid was good balaced between stsudies and activities. On the other hand, the teachers was very patient and friendly; he tried to organize the content to be the most suitable for me. Now I can understand in general what people are talking about in Spanish!! Thank you!”.